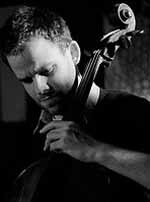 As a founder member of the Age of Wire and String and as cellist with the Glasgow Improvisers Orchestra, Peter has performed and collaborated extensively with both Scottish and International musicians. Work in this area lead to his joining the One Ensemble in 2003. Combining a classical training with his experience as an improviser, Peter has had the opportunity to work closely with composers and with musicians from diverse cultures, including a recent project with Ravi Shankar.